In some ways, Steven Spielberg’s Jurassic Park movie in 1993 was my Star Wars. I was eleven years old with a wild imagination, and I remember sitting in the theater in a state of complete wonderment. The spectacle blew me away. The characters were instantly iconic. 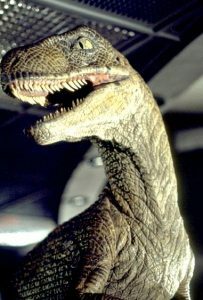 I made my parents buy me a velociraptor toy, which pounced and gutted my G.I. Joes in countless battles. I tried reading Michael Crichton’s Jurassic Park novel when I was a teenager, but I just wasn’t ready for it…despite an above-average reading level. Michael Crichton and I just weren’t seeing eye-to-eye like me and my man Spiels (Spielberg said I can call him that, promise). So, now that I have this fancy blog, I thought why the heck shouldn’t I jump back into the little tropical island 150 miles off the coast of Costa Rica and see how the Jurassic Park movie and book size up. In the strictest of terms, no. Spielberg’s movie feels much lighter to take in than the book, and it’s not just because of its two-hour runtime. Two examples: The book came across as much more gory and horrific. Also, the book spends page after page debating whether or not science, progress, and capitalism should supercede laws of nature while the movie touches on it in one or two simple, albeit classic, scenes (who doesn’t love the “life finds a way” line?). Full disclosure, Crichton penned many other of the instant one-liners that made it to the big screen. 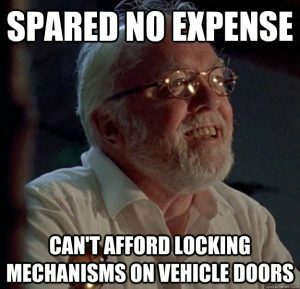 Hammond’s “Spared no expense!” corporate buzzword on the other hand is a movie-exclusive, and it’s worth calling out because it’s a prime example of how the movie shortens and softens the book’s heavy themes so well. Spielberg waters down the book’s major ethical questions, and there’s too much missing to say it’s a true screen adaptation. I won’t go into scene-by-scene spoilers. But, chief among the departures are who lives and dies; who saves whom; shifts in many character relationships and roles; dramatic scenes (including a particularly tense river ride) were cut, and at least two plot-dependent dinosaurs were left completely out of the movie. It’s understandable from a budget and feasibility standpoint to limit the dinosaurs and consolidate their roles. To be clear, the movie’s special effects and animatronics were as groundbreaking as a T-Rex curbstomp. But, the kid in me says the more dinosaurs the better. Yes, there were major departures. But, that doesn’t mean they weren’t warranted. The movie was rated PG-13, and a lot of Crichton’s material skewed toward mature content. 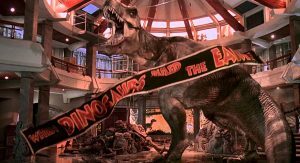 Exploding raptors, human kabobs, and thick, recurring rhetoric on corporate and scientific irresponsibility and hubris were toned down for a younger audience. The kids play more impactful roles and Dr. Sattler (played by Laura Dern) is a far stronger presence in the movie than the book. In my opinion, these are all good things that work well on-screen. After all, even Crichton admits in his book that dinosaurs are for kids…which makes me wonder why the novel is meant for older readers. While I’ve seen most of Spielberg’s catalog, this is my first Crichton book. He strikes me as a modern-day H.G. Wells or Jules Vern due to the pages he spends going into thick scientific details. Schindler’s List aside, Spielberg’s bread-and-butter leans toward popcorn movies. You would think these styles would clash, but the two creative geniuses managed to make the movie work to record-breaking effect. The movie is like a headlining rock band covering an old classic country song–it takes the source material and makes it into something new. I would recommend heading to the library and finding both of these Jurassic Park experiences. I haven’t read or watched the sequels, so I can’t say how the book-to-box office comparison shapes up across the whole series. But, the original is 100% worth it.